Ok, so I was a bit ranty on the Twitters last week. And on the blog. And on Google Chat, as well. And I promised that I would be better this week but it's Wednesday and someone is wrong on the Internet. So here I am. Do a Google Search for "email reply all etiquette" and you know how many results you get? 50 Million results. 50 MILLION. Because apparently Reply All-ititis strikes in all workplaces. Well, geeks, I have a solution to propose. An end to all the flippant, emotional reply alls that happen around the world each and every day. Feeling the heat of the moment? Going to blast an email off to the entire company about the new TPS report regulation that the boss' executive assistant just sent out to everyone? Oh, yeah, click that Reply All button. Feels good, eh? Doh! 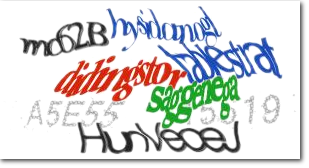 CAPTCHA. Dammit. Delete email and get back to work. I'm telling you, using the world's most hated technology to prevent unnecessary Reply All is the only way we will be able to stop the problem from spreading. What do you think? Can we make it happen?